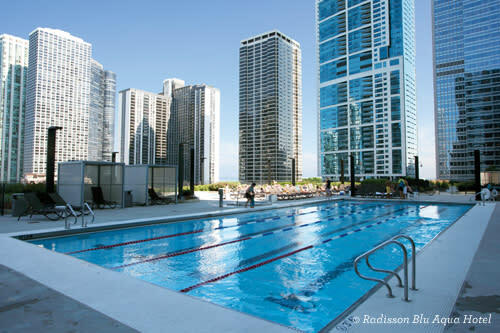 See which Chicago hotel pools are making a splash! Splish splash, cool down and relax at these alluring Chicago pools. Yes there&apos;s 26 miles of lakefront to wander and a different Chicago beach to explore every day of the week, but for a stay that promises swimming weather year-round, book one of the many Chicago hotels with an on-site swimming pool. This 1929 Magnificent Mile charmer evokes bygone eras with marble columns, high ceilings and Spanish tile surrounding the heated Junior Olympic-sized swimming pool. The gorgeous pool room features stadium lounge seating and original accent fixtures with an indoor balcony overlooking the pool. The indoor heated rooftop pool at this River North Kimpton hotel sits on the 17th floor and serves up wide downtown views and a poolside New American menu from onsite Sable Kitchen & Bar. Grab a drink on the terrace or chill on the outdoor sundeck. 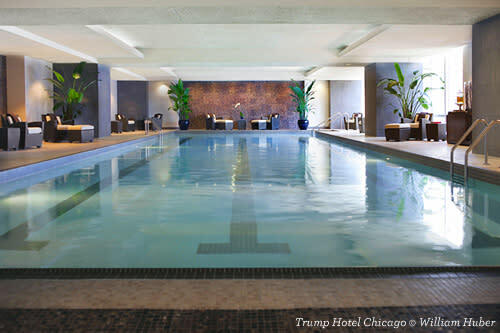 Situated on the Chicago River with breathtaking views, even the locker room at the sophisticated Trump is posh. Sip on complimentary cucumber water, dip into the peaceful three-lane pool and soak up floor-to-ceiling views of the city at this 2015 Forbes Travel Guide Five-Star Hotel. Shimmering lights give the 67-foot swimming pool a magical feel and guests can indulge in a heated hydrotherapy Jacuzzi, two aromatherapy showers, four heated relaxation recliners and more at this 52-story downtown landmark tower designed by renowned architect Mies van der Rohe. 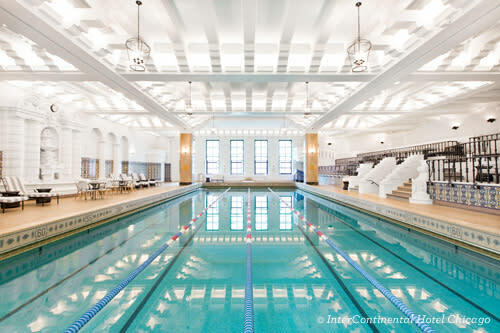 Roman columns and a stunning gold-trimmed domed glass ceiling highlight this Magnificent Mile pool. The lavish 50-foot pool and whirlpool are open until 11 p.m. every night, making for a lovely Mediterranean-inspired nightcap. Luxurious relaxation is the theme at this 25-meter lap and wading pool. Enjoy two additional pools and sprawling outdoor space that includes a hot tub, sauna, sundecks, fire pits and cabanas. Health magazine voted The Peninsula Chicago among "America&apos;s Healthiest Hotels" for its wellness-focused 19th and 20th floors. Float around in the half-Olympic length swimming pool encased by 20-foot floor-to-ceiling windows overlooking the city and Lake Michigan.